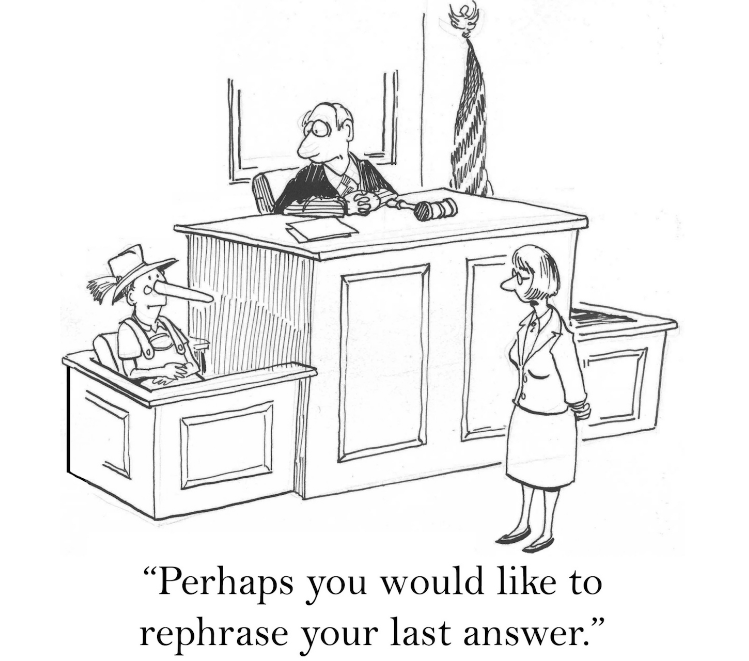 This cartoon takes place in a courtroom (where legal processes and trials happen). We see the judge behind what looks like a big desk, which in a courtroom we call a bench. He has a gavel in front of him, a thing that looks like a little hammer and is used to get people’s attention. Sitting next to the judge is the witness box, where people who are being asked questions by the lawyers sit. Inside (sitting in) the witness box we see an old man with a hat and a very long nose. A lawyer (attorney) is standing in from of the bench. The joke here is based on the Italian children’s book, The Adventures of Pinocchio, which became popular in the U.S. when Disney made a movie about it. In the story, if Pinocchio lied (did not tell the truth), his nose would grow longer, so everyone would know that he had lied. The man in the cartoon has a very long nose, indicating that he has lied about something. So the judge asks him if he would like to rephrase his answer. To rephrase means to say something in a different way, in order to be clearer or more easily understood. It is an expression often heard in courtrooms. This man needs to rephrase his answer not to make it clearer, but because he lied. What if our noses actually DID grow longer when we lied? No doubt we would all look a little like this poor (unfortunate) man! This entry was posted in Jokes and Humor. Bookmark the permalink.